Use your brain waves to reach out and touch someone. Researchers in the Mobile Sensing Group at Dartmouth University have developed a cool new way for you to call a friend: think about him. 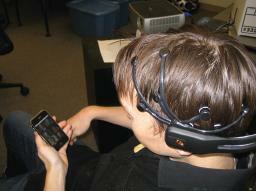 Their Neurophone project connects an EEG headset from Emotiv with a typical smart phone. The Emotiv headset monitors brain activity through the head’s surface and can tell when you’re concentrating (usually). A program running on the phone cycles through images of your contacts and when it reaches the one you want to call, it can tell that you recognize and are thinking about that image. While I don’t see us all walking around with $300 headsets for a moderately improved way of sifting through our contacts lists, the demo for Neurophone is pretty cool. Check out the video below and see for yourself. When Tan Le demonstrated the Emotiv headset (named Epoc) at TED, she implied that the relatively inexpensive EEG device could enable a new era in brain computer interface research and applications. Well, the Neurophone may not be very practical, but it’s an interesting start. And, the Mobile Sensing Lab isn’t even the only group to think of pairing EEG with mobile phone address books – we’ve shown you a very similar application using a NeuroSky EEG headset. Looking at these two projects, however, I’m reminded of why the most popular commercial applications for EEGs seems to be as typing assistants for the paralyzed. EEG is not a good way to quickly sort through data. If you don’t have to use it, I doubt you’ll really want to – it’s that slow. Despite what you’ll hear in the video below, I think that cycling through images of contacts is going to be a much more tedious way of finding who you want to talk to than simply scrolling through an alphabetical list with your fingers. We’ll probably find some interesting applications for EEGs in the future, but I doubt they’ll look like this.